You have probably heard of hairballs from cartoons or movies, but what is a hairball? Is it normal, or is it a sign that something is not right with your cat? A hairball (fur ball) is the unpleasant looking cigar-shaped wad of fur your cat might vomit up. It gets the tubular shape when hair gathers in your cat’s esophagus. Not really. All cats groom themselves and the normal result is hair that they may accidentally swallow will pass through into the feces. When hair builds up and doesn’t pass through, there may be a problem. It may be a result of excessive grooming (anxiety, skin disease or discomfort, or parasites) or abnormal movement through the digestive tract. Are Certain Cats More Prone to Hairballs? In an informal survey* only 10% of short-haired cats brought up two or more hairballs a year, 17% once a year, and 73% never brought up hairballs. Long-haired cats were twice as likely to throw up a hairball. If your cat vomits more than 2 real hairballs over the course of one year, you should discuss this with your veterinarian. If you find vomited liquid with strands of hair on the floor, you should take your cat to your veterinarian to investigate the cause for vomiting. Are There Other Things that Mimic Hairballs? When a cat “coughs up” a hairball, they are actually vomiting. When cats stretch out their neck and make the same sound but don’t vomit a hairball, it is commonly a sign of asthma. You should bring these issues to your veterinarian’s attention immediately. Can Hairballs be a Problem for My Cat? If too much hair is building up and cannot be passed in the feces or as a hairball, if may cause an obstruction in your cat’s upper intestinal tract. This will cause vomiting, abdominal pain, decreased (or no) appetite, and, if not treated, serious fluid and electrolyte problems. If a hairball is stuck in your cat’s intestines or stomach for a long time, it may mineralize and become very hard. Sometimes, when a cat is vomiting a hairball, it can get stuck and cause damage to the esophagus (e.g., megaesophagus, strictures). How Can I Prevent Hairballs? If your cat is prone to hairballs, the following may help. 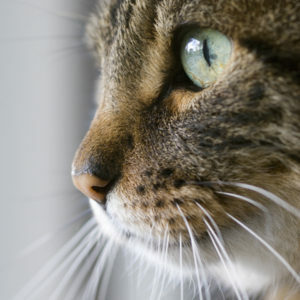 Always seek veterinary advice and discuss your cat’s individualized care. Comb out loose hair every day; use a damp cloth or paper towel to remove fly-away hairs after combing so your cat doesn’t swallow them. Clipping long-haired cats may be required. Look for causes of pain if your cat is focusing on grooming a particular area. Look for other causes of skin discomfort. Feed small amounts of food to improve intestinal motility. Hairball diets have increased fiber that might help motility. They should not be used instead of looking for an underlying cause of hairballs! Discuss special diets with your veterinarian. Hairball remedies help lubricate the intestinal tract and may ease passage of hair. They again should not be used instead of looking for an underlying cause of hairballs! Pro-motility medications may improve gastric emptying. Yet again, they should not be used in lieu of looking for an underlying cause of hairballs! *Cannon M. Hairballs in cats. A normal nuisance or a sign that something is wrong? J Feline Med Surg 2013; 15: 21-29.